As luck would have it, a business associate invited me to a weeknight dinner meeting in Midtown Sacramento at a place that I must have driven by dozens of times over the last few years. I am speaking of her her favorite sushi restaurant in the area, Lou's Sushi. Located at 28th and P, on the night of our visit Lou's attracted an eclectic mixture of patrons. There seemed to be a mix of neighborhood aspiring artist and hipsters, young couples, ambitious staffers who wandered over after a long day working in the State Assembly or perhaps associates from a Capitol Mall law firm, to a guy seated at the table next to us who could be cast as Spicoli if anyone dared to remake Fast Times at Ridgemont High. Although the dining area is small and at times busy, there seemed to be a natural flow to things. It was as if the neighborhood customers knew when it was time to come in and grab a table without waiting. My companion took it upon herself to order an interesting array of appetizers to start our meal. We began with some fresh oysters on the half-shell. and entree we enjoyed at Lou's Sushi. 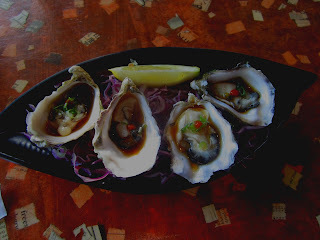 While having always enjoyed oysters, my preference has been for smaller ones which I find tastier. 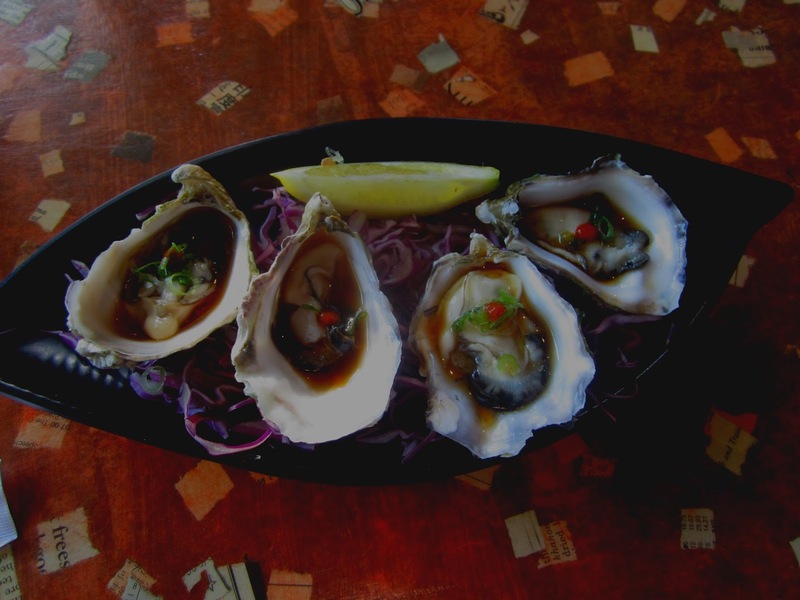 Our oysters, which were happily small, were served with a dash of sweet vinegar which complimented their freshness. Very nice. Our other appetizers included Fried Secret Tofu, BBQ albacore, and The Devils Eggs. While my companion said Lou's is known for the albacore, which was splendid, I found their spin on deviled eggs, with their wasabi and panko crust unique and different. For our entrees, we enjoyed two rolls - the Zig-Zag which featured fried soft shelled crab, and the 6 Item which included tempura shrimp. Both rolls were quite good and fresh. Although we did not order any, Lou's also offers by my count seven vegetarian rolls, which seems to be a recent trend among sushi restaurants. Unbeknownst to me, my dining partner told me that Lou's recently underwent a tumultuous management shakeout that left her and several other regulars concerned it might affect quality. In her view, the tumult did not affect the quality, and the changes she opined might have taken things up a notch or two. As for our servers, Monica and Billy were both friendly, quick, attentive and most importantly, not overbearing. Although the dining area was small and busy during our visit, they never seemed to be rushing us through our meal to free the table for other customers. Aside from an impressive mural of the restaurant's namesake on the side of the corner building and minimal signage, Lou's is one of those places that you might easily drive-by going to other more visible spots deeper in Midtown Sacramento. Next time you are in Midtown near 28th and P, don't drive by, or better yet, head directly over to Lou's for some fine sushi. Lou's Sushi, 2801 P Street, Sacramento, 916-451-4700. No Comment to " Stop, Don't Pass Sacramento Midtown's Lou's Sushi "